There are many ways to make sure that your netball court is completely clean, we understand that netball court cleaning is a lot of work, so we offer a number of maintenance services to help you. With any netball sports surface it’s extremely important that you take into account netball court cleaning and maintenance as it does a world of good for the whole facility. A regularly and properly cleaned court will be more durable and have a much greater product life than one that is neglected and uncared for. 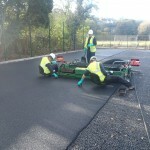 The netball court cleaning process also makes the surface a lot safer for the people using it, giving them more grip and reducing the chances of tripping on any contaminations. A deep clean makes sure that the surface is completely clean and clear of any dirt and debris, if the netball court has and of these contaminations it can lead to the surface losing its porosity and ultimately result in flooding due to poor water drainage. If your court begins holding water, this is a big sign that your netball court is in need of a thorough clean. A standard netball court clean with a power washer will make sure that any potential contaminations such as moss, algae, dirt and leaves are completely removed; making the whole surface a lot safer to use and also ensuring it has the best possible playing characteristics. Carrying out regular netball court cleaning and brushing can also combat any slippery areas to prevent injury to players. 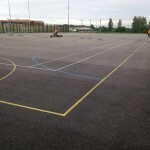 We understand that the costs of cleaning and maintaining a netball court surface may seem an unnecessary expense, but the costs of netball court cleaning should be included within any budget of netball construction prior the actual job taking place. It’s extremely important that your surface is completely clean at all times to make sure it’s safe and of a good quality. Costs of cleaning netball surfaces will over time begin to pay for themselves as the more maintenance and cleaning your court has the longer the product life for the surface. One of the key factors in the costs of cleaning the surface is the size and dimensions of the court, obviously the bigger the court, the more expensive it is to clean. 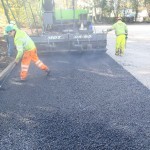 You will not have to replace or repair the surface anywhere near as quickly as you would with a court which doesn’t have a thorough and regular maintenance schedule; the plan is designed to ensure you get the most for your money and the most out of your netball surface. Costs of cleaning netball surfaces are completely necessary for the netball surface to thrive properly and provide a positive experience for players. We strive to offer an outstanding service and selection of products for you as well as making sure you get the best value for money whilst still sticking within your budget by helping you reduce costs and prices where needed.